By the 1570s, the south chapel would have been pleasantly cramped with five monuments whilst the north side still had just one. In the 1940s this monument was tentatively attributed to Epiphanius Evesham and since then this ascription has been repeated often, including in Pevsner. However, both White and Bayliss disagree with this attribution and Bayliss has suggested it is the work of a William Hargrave of Bilborough who worked at Wollaton Hall. In 1887, when it was relocated, the inscription was moved from the foot end of the monument to the head end. Although this is the only monument with fully carved figures, it would still have read very like the other four chest tombs, each monument consisting of images in the top two thirds and an inscription in the bottom third. This similarity is now lost and with it the visual clues that relate these monuments to each other. 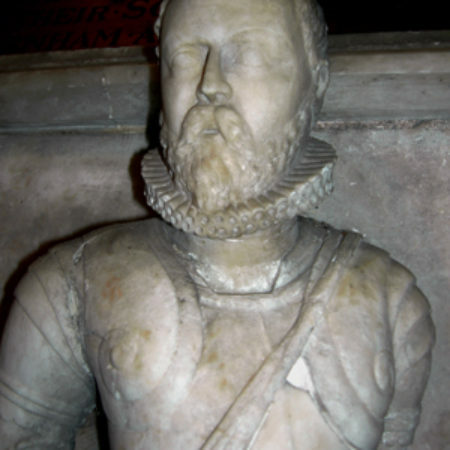 As a young man, John had been a soldier and then became a pensioner at the court of Elizabeth I. He was rarely in Quorn and sold Nether Hall to Thomas his brother for £80. It was bequeathed back to him when Thomas died (1562). On John’s demise it went to the next brother, Matthew. Although other estates went to the daughters of John and Thomas it seems that it was important to keep the Quorn property in the Farnham name. John’s will makes interesting reading. Not only does he allow 100 Marks for a funeral ‘answerable to my degree’ and an equivalent sum for his monument, he also lists possible places for his burial. His first choice is the ‘north side of St Bartholomew’; his second is in ‘Christ church within Newgate by or near unto my good friends Walter Haddon and Nicholas Beaumont’. 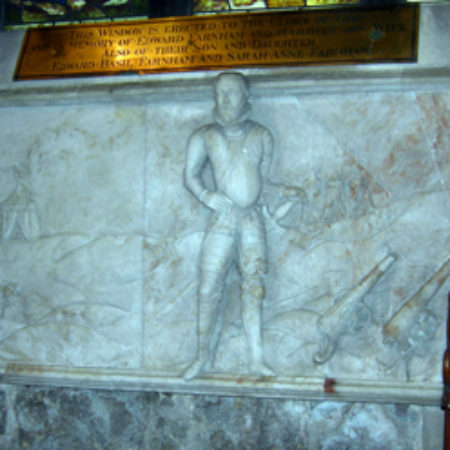 We don’t know how much his monument cost, but 100 Marks is about £66 which is a substantial amount to spend on a tomb. On the inscription it was important to let it be known that ‘he descended of an antient house’. He takes his place alongside the rest of the family, but also manages to redress the balance between the north and the south side by commissioning a very large and splendid monument. John also departs from the sentiments so far expressed in the other inscriptions. He is neither in ‘rottenes’ like Thomas nor is he extolled for his modest and responsible lifestyle. He is celebrated both for having lived an exciting life – firstly on the battlefield ‘for youth the best expense of days’ and then at court ‘where princes great he truely served … for good conceit and pleasant wit favord in every place beloved of the noblest sorte well liked of the rest.’ This post-Reformation inscription celebrates John’s secular achievements and there is no purgatory to worry about because ‘the heavens his soule containe’. Traditional values were upheld on the modest inscribed slabs made by the Royleys, and John Farnham’s superb tomb, displaying an engagement with what was then termed the ‘new style’, is a complete departure from them. 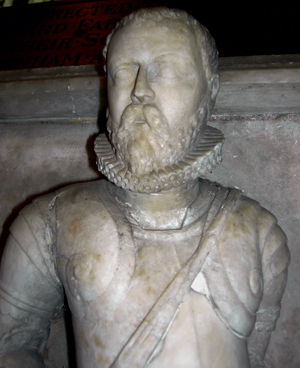 So what of the putative Robert de Farnham alabaster relief? (Fig 7) Well it certainly doesn’t date from the fourteenth century, but it could have been created later to commemorate this infamous ancestor. This would beg the question why was it commissioned 200 years after the event and originally placed in the North chapel? 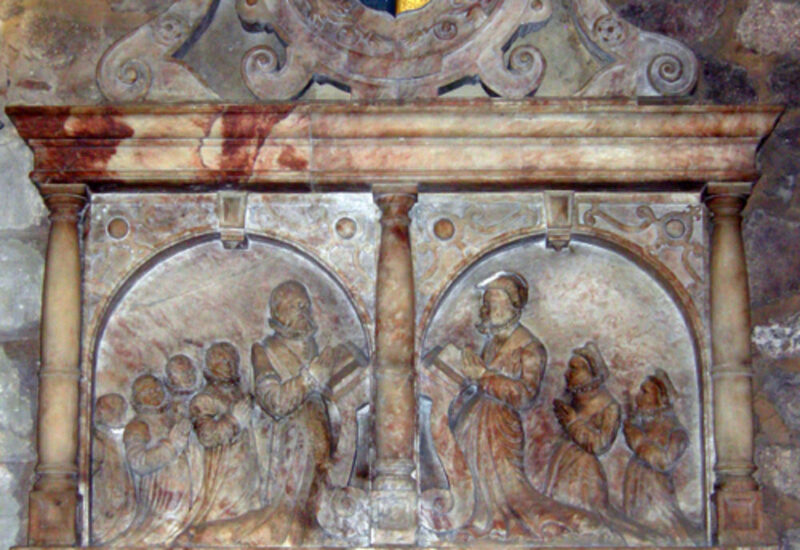 Kemp observes that there was a fashion for depictions of scenes in the life of the deceased, which started to occur at the end of the sixteenth century and he includes this relief as an example. This would make it a portrait of John. But, I think it is more complex and that this ambiguity was intentional from its inception. 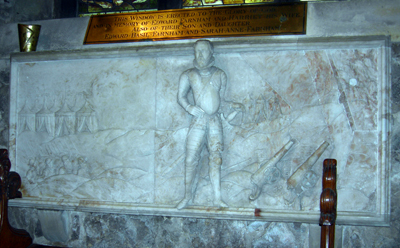 John or the commissioners of this relief were playing on the parallel of both he and Robert being soldiers. 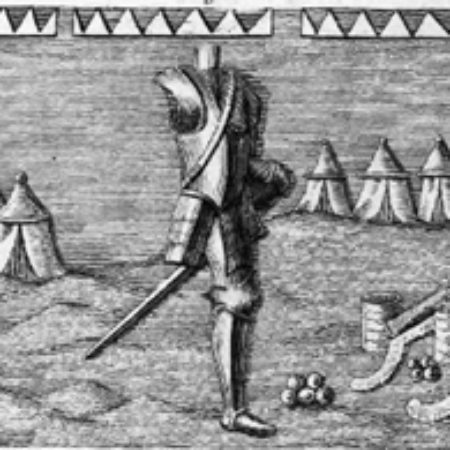 John on the cadet side of the family is attaching himself to Robert de Farnham, a common ancestor, perhaps in order to suggest that like Robert, he too had a flamboyant lifestyle and was anything but repentant. Available at Leicestershire, Leicester and Rutland Record Office. Commissioning document: 26D53/2751 9 Aug.1585. Agreement betw. George Shirley of Staunton Harold Esq., and Richard Royley and Gabriel Royley of Burton on Trent, tomb makers. Greenhill, F. A., (1958) The Incised Slabs of Leicestershire & Rutland. Leicestershire Archæological and Historical Society, The Guildhall, Leicester. 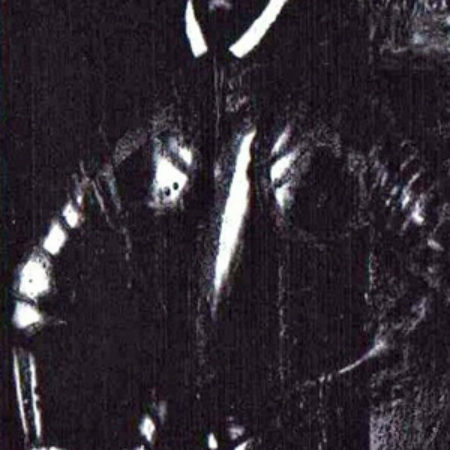 Kemp, B., (1981). 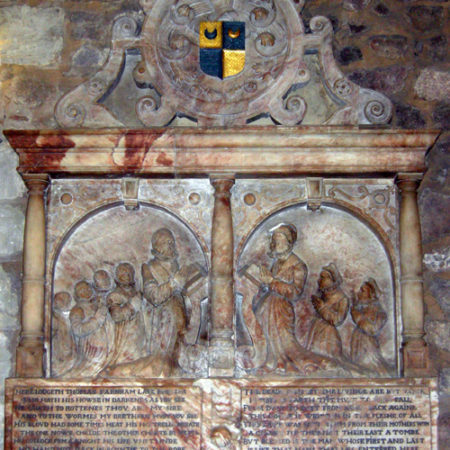 English Church Monuments. London, Batsford. 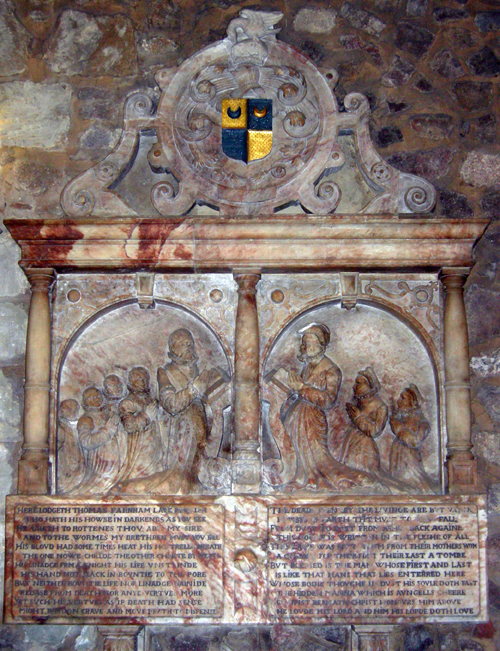 The most expensive Royley monument, to Thomas Fermor (d.1580) at Somerton was contracted to cost £40. 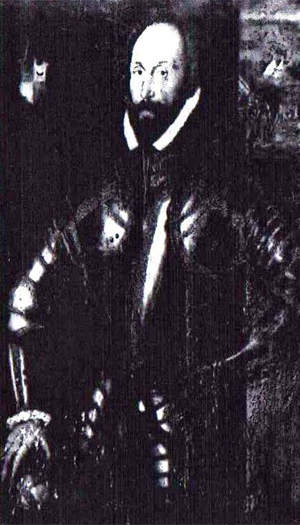 Robert de Farnham went to war to avoid charges for ‘robbing Elena le Rous on Barrow Bridge’. He acquitted himself with such credit he was pardoned and able to return home.